On the walk of two days while traveling from Marrakech to the Central high atlas, while going upward the bridge of Imi-n‘ifri towards the valley of Ait boulli berber over the valley of Ait Bougmmez at the first night. 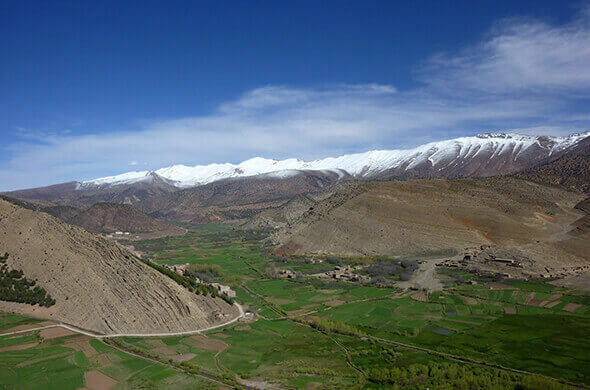 Walk from the village of Berber for three days walk to explore the best view is offered by central high atlas. Getting back through a different route, you will encounter the unforgettable visit of waterfalls “Ouzoud” in Morocco where you can take lunch before traveling back to the Marrakech. After getting early for breakfast in Marrakech, get and drive to Ait Bougemaz valley through Demnate and Imi n'iIfri, at the natural bridge visit, keep way on ait Bougmaz through Ait boulli valley. Upon landing, lunch in Agouti and after that begin a guided visit by walk to Aarouss gorges and waterfalls, trek back to Ikhf n'ighir town. Get up for the walk towards Ait Ourit Mountain at 2606m, after breakfast at the gite (1880m), dazzling horizon over the entire valley, move down towards Sermt town (1886m), a wide green valley with heavy Kasbahs. Get to the walk downwards after breakfast, along Sermt valley and cross a few Berber villages including Tachgdilte, Ayadal. It's a totally separated place, hunting towns on the hells of the Mountains and developed terraces, breath-taking view over the canyons, entry to Jomoaa Ait Abbas. Get to Marrakech by means of Azilal and Ouzoude waterfalls.